The first time I ever heard of The Apron was at the Hot Chefs Cool Jazz event hosted at the Vancouver Convention Centre. At their food station, I was introduced to 2 unique little bites. 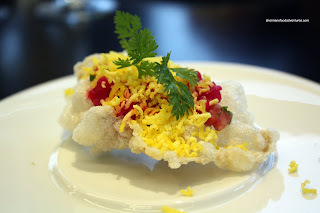 The first was a Beef Tartar served on a crispy tendon. The second was Puffed Foie Gras. With those 2 offerings, I realized that The Apron's Executive Chef, Hamid Salimian (no longer with the Apron, he has moved to Diva at the Met), was not afraid to experiment and to think out-of-the-box. Coincidentally, a few weeks later, I recieved an invitation to a tasting at The Apron by a good friend of Chef Hamid on his behalf. 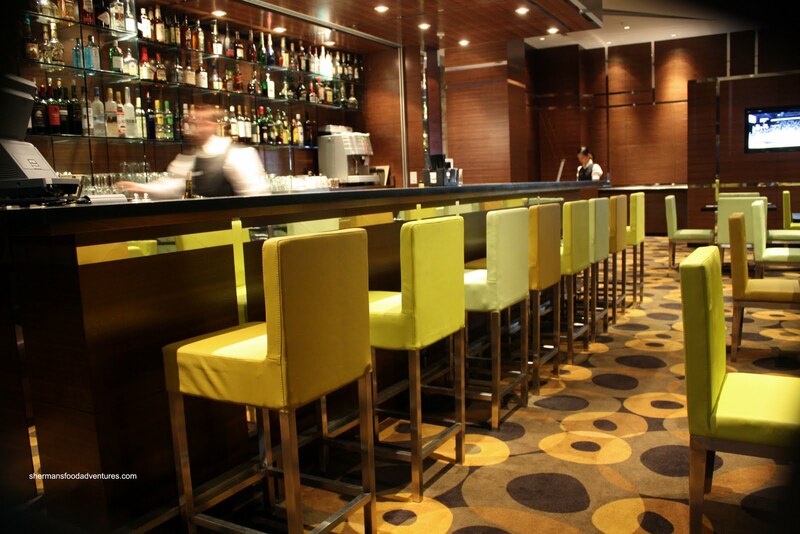 Located in the new Westin Wall Centre, The Apron is a modern; yet small restaurant which is both classy and casual. The location is a bit odd since the hotel is situated among car repair shops and empty lots. There is not much in the way of street parking; however, there is complimentary valet for patrons of the restaurant. Once the area is fully developed, I can see everything looking less disheveled. At this meal, I finally met Matt who writes for Vancouver Slop. It's strange that all this time, we've never crossed paths. He is indeed a very knowledgeable foodie and I certainly hope he can put up with me for another meal sometime down the road! Anyways, with little delay, the feast came at us fast and furious. We started with the Kushi Oyster in a Garden. Presented as if it was a garden, the oysters with a yuzu cloud, sat among edible garnishes. 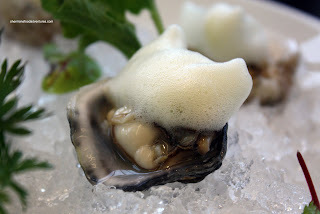 First and foremost, the oysters were fresh and the nice touch of citrus really helped accent the natural sweetness. It was so refreshing that I could've ate the whole garden by myself (which is quite believable with all types of gardens). Next up was a very interesting interpretation of Popcorn Shrimp. Normally, most people associate popcorn shrimp as something breaded and fried. In this particular version, there are indeed shrimp; but the similarities end there. 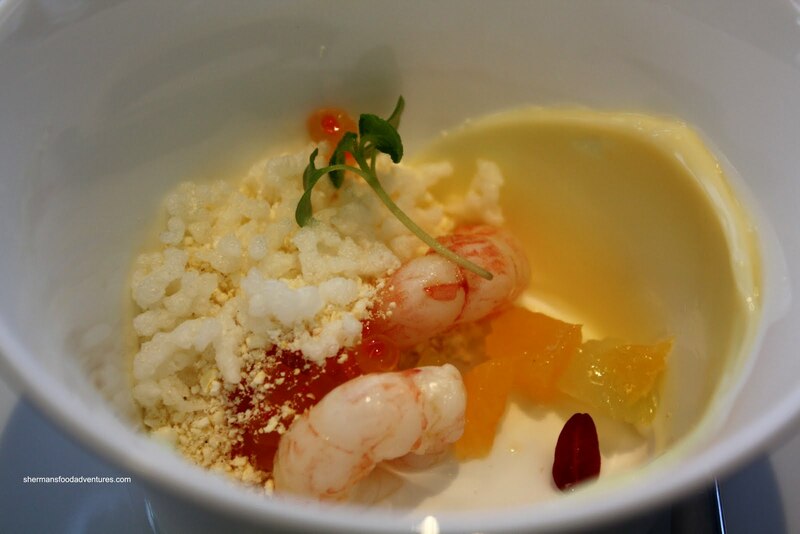 With mini spot prawns, smoked steelhead roe, powdered popcorn, puffed rice, mayonnaise and orange pieces, this was not like any popcorn shrimp I've ever had. With so many components, the result was a good contrast of textures between the shrimp, roe and crunchy bits. Furthermore, the smoked flavour of the roe and tartness of the orange provided a nice balance. At this point I was yakking about how I remembered the 2 offerings from the Apron station at the Hot Chefs Cool Jazz event. As if they had read my mind, the Beef Tartar and Crispy Tendon arrived. So, we essentially have a piece of crispy tendon (yes, not a misprint) employed as a serving and eating vessel for the beef tartar (comprised of pickled shallots and crumbled egg yolk). Although this is a very clever offering which is also quite unique, I'm personally not all that fond of it. I get the concept of the crispiness being a contrast for the soft beef tartar. Furthermore, I understand the pickled shallots representing the acid in the dish. However, much like the first time I had it, it didn't elicit much of a response from me this time either. Viv thought it lacked flavour despite the many components. Okay, that concluded our amuse bouche portion of the meal, now onto the dinner (albeit smaller tasting portions of course). 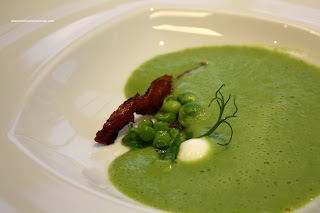 Another interesting take on a classic was the English Pea Soup. We were first presented with a bowl with the individual ingredients for us to see before the pea soup was served table side. With the use of molecular gastronomy, we had the buttermilk served as a bubble. 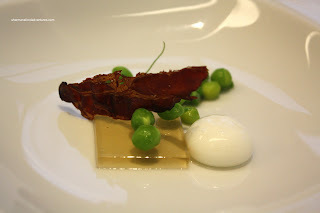 A mint "crouton" (more like gelee), Tyrol bacon and peas rounded out the ingredients. Combined with the smooth pea soup, each item contributed to the flavour profile in a clean and discernible fashion. I could taste the mint, buttermilk and bacon; yet at the same time, they all went well together. Now, the second item from the Hot Chefs Cool Jazz event was the Puffed Foie Gras. I remembered this one fondly. I was ever-so-happy to see it again! Chef Hamid explained how he "puffed" the foie gras; but honestly, I wasn't listening. My mouth was just watering... By virtue of being puffed, the foie gras is appreciably lighter and airy. 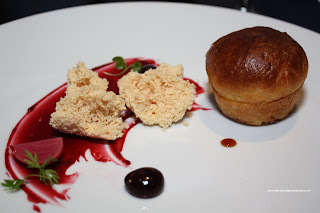 Accompanied by a sour cherry fluid jelly, port, beet and warm brioche, this was a luxurious; yet easy dish to eat. There was just enough tartness to cut through the richness of the foie gras. At the sixth dish, most tasting menus would be wrapping up. Oh no, we were only HALFWAY though! 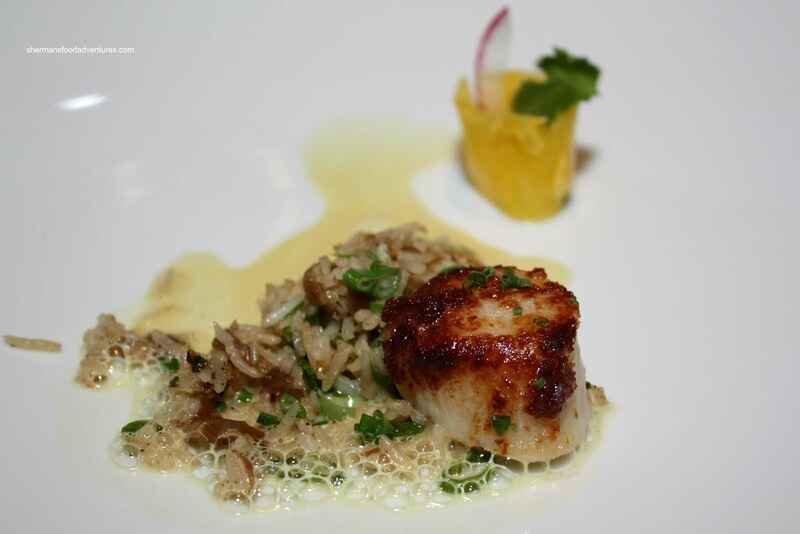 Arriving next was the Seared Scallop with spiced basmati rice, coconut curry froth and pineapple carpaccio. A pretty straightforward dish with the scallop cooked perfectly with nice caramelization. The rice was good; but due to the small amount, it didn't add much to the dish. 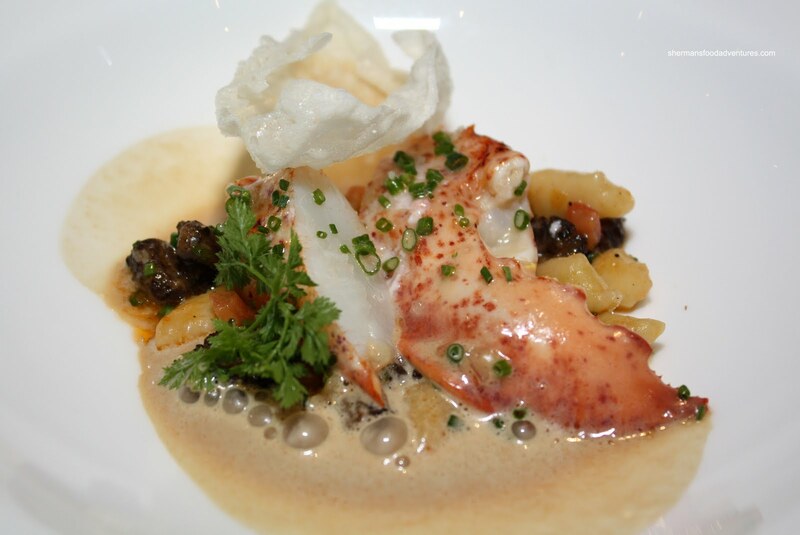 Okay, onto the second half of the dinner... We got Lobster with Yukon gold gnocchi, morels, Parmesan crisp finished with a lobster emulsion. The lobster consisted of a whole claw which was cooked perfectly. The naturally sweet flesh went well with the fragrant emulsion and earthy morels. The gnocchi were tender and of a perfect size. 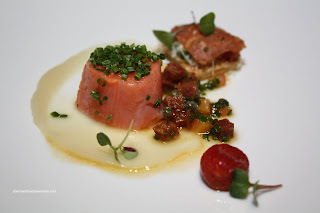 Heading back to the molecular gastronomical well, we got the Sous Vide Pacific Provider Salmon served with Provencal tart, apron chorizo a nd sunchoke coriander vinaigrette. As mentioned by another diner at the table, the salmon was devoid of texture due to the sous vide method of cooking. This may be one of those dishes that one will either love or hate. For me, I loved the flavours (especially the chorizo), but the salmon was indeed too mushy for my liking. Now, here comes the epic fail. No, not in terms of the food. I was so enjoying my Queen Charlotte Sablefish that I forgot to take a picture of it! *Gasp* the horror!!! Let's just say that it was seared perfectly with a nice crisp exterior. 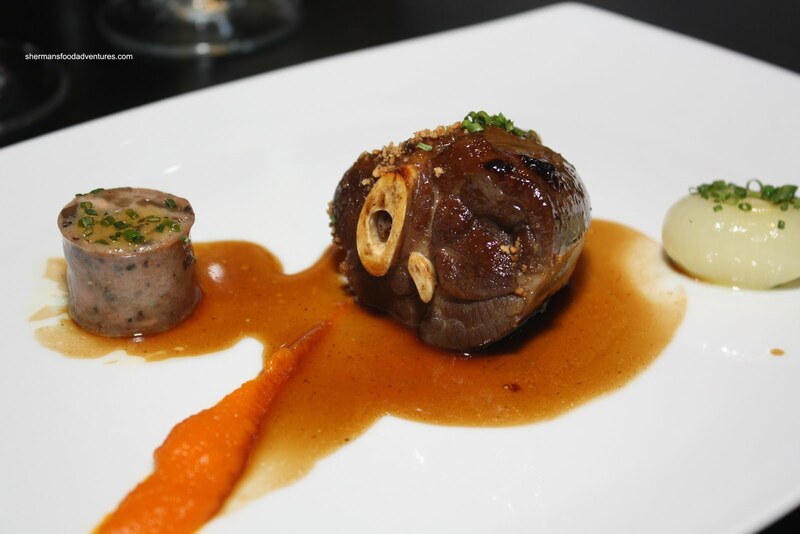 Thankfully, I did n't forget to take a picture of the Slow Cooked Lamb Shank accompanied by sweet bread foie gras sausage, cipollini onion, whipped carrot and natural jus. If you know me, I really like lamb; thus, I'm a bit picky regarding its execution. This particular piece of lamb was prepared excellently being moist and gelatinous while still maintaining its meatiness. I especially liked digging out the bone marrow. The sausage was interesting and quite good; but I'm not sure how it tied into the dish particularly. It was meaty richness upon meaty richness. Finally, we made it to dessert and we started with a "pre-dessert" of White chocolate and Kalamansi. 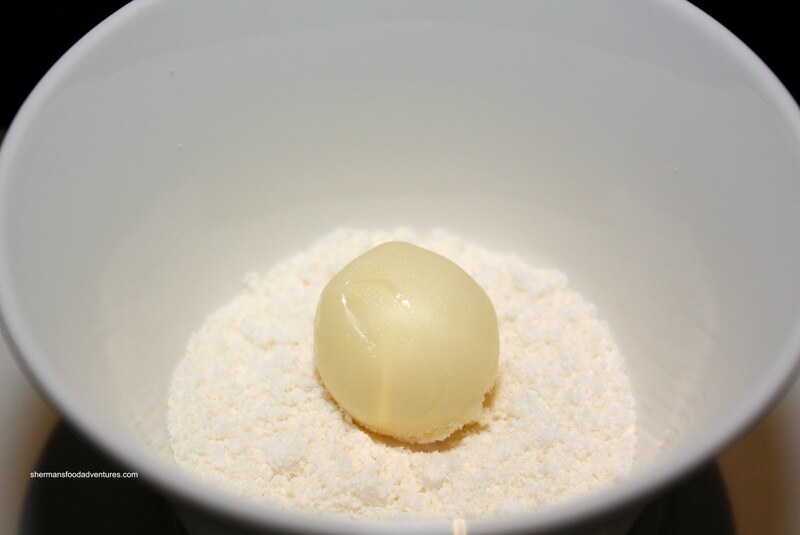 It consisted of a ball of white chocolate filled with liquid kalamansi (it's a Chinese orange) resting on a bed of powdered white chocolate. The trick is to put the whole thing in your mouth and let it "pop". Once again, a very creative offering; but the presentation would've benefited from some colour. So our last course... finally... was the Sous Vide Apricot Tart with Babes honey ice cream, rose water marshmallow and almond & hazelnut soil. This was a pleasant end to the meal. 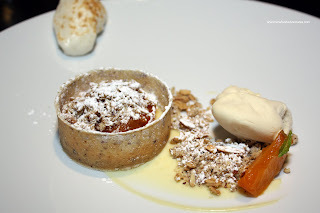 I particularly liked the soft and sweet apricot paired with the deliciously smooth ice cream. With the sheer amount of items we got to sample, naturally, there would be some that I liked and some not so much. With that being said, the tasting was quite good. I really enjoyed Chef Hamid's creativeness and willingness to take chances (and the use of molecular gastronomy). It's not often that we see this type of risk-taking at Hotel-based restaurants. Of course I expected the food to be prepared carefully since I was invited to this tasting; yet no one can question Chef Hamid's skill. It remains to be seen if other patrons will appreciate his creations; but at the very least, it will not be boring food. Obligatory question... $$$? OK, this was an invite but, had you ordered a la carte or a tasting menu, what would have been the damage? Kim, there is no tasting menu per se, but if I were to order each individual item (bear in mind that the sizes would be bigger), they range from $16-$25 per dish (http://www.vancouverslop.com/2010/06/apron-gastronomic-journey.html). So it's reasonable considering the quality and nature of the restaurant. With that being said, some items were better than others.